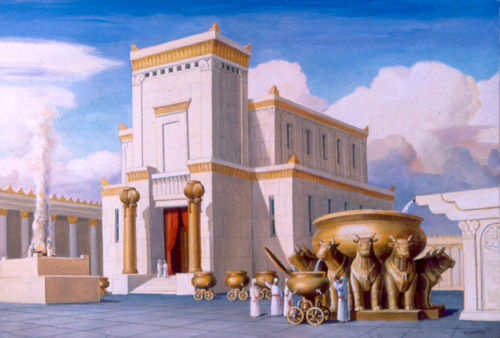 God claims the Temple of Israel as his residence on earth, the place on the map where he can be most fully encountered. Israel, and the city of Jerusalem itself is indeed privileged, but Solomon displays his God-given wisdom through his acknowledgement that God doesn’t claim Israel only for Israel’s sake. It is important, indeed important enough to mention at this key moment of Israel’s history, that God will do what is best when he listens to the foreigner. Solomon asks that God do everything that the non-Israelite asks of him when this person comes to pay homage to him at the Temple which Israel has built. Why should God do this? So that not only Israel, but the entire world which God ultimately claims would know what God is like and therefore revere him. But why would the foreigner come to the God of Israel through the Israelite Temple in the first place? For the same reason, God’s reputation. As a result of God’s work in Israel by being present in a special way among them, the world would know about God and his power and want to experience it for themselves. That is one of the purposes of having the Temple in the first place. “As God’s household, you are built on the foundation of the apostles and prophets with Christ Jesus himself at the cornerstone. The whole building is joined together in him, and it grows up into a temple that is dedicated to the Lord. Christ is building you into a place where God lives through the Spirit.” (see also 1 Corinthians 3:16-17). The church, the people of God, are now Yahweh’s central place of activity. If you want to know what this God is like, if you want to check on the reputation of the creator and lord of the universe, look at those people among whom God dwells. Is God being faithful to his promises? Look to his people. Is this God powerful? Investigate what he is doing among those who claim that he is. Just who is this God in the first place? Ask the people who wear his name tag. It’s a great privilege, and as we know, a great responsibility. It is a vivid reminder that salvation is not an end in itself. Because, in God’s economy, you come to know him so that you can make him known.